A word of warning before we entice you with these delicious berry recipes: don’t pick blackberries after 29th September. Before September 29th blackberry-picking can be indulged in to your heart’s content – and, indeed, should be, for what else is free, tastes delicious and is good for you? Rub the fat into the flour using your fingertips until you have a breadcrumb-like mixture. Sir in the sugar. 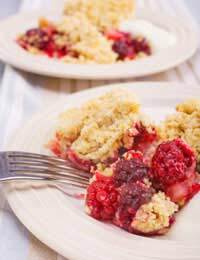 Sprinkle over the apples in the dish and bake for about 35 – 45 minutes until the crumble is golden and crisp. Use with pancakes, ice cream, yogurt or as alternative to gooseberry sauce with oily fish like mackerel. Place the sugar in a saucepan with the juice of the orange. Heat gently until the sugar has dissolved. Add the blackberries and bring to the boil. Simmer for 2 – 3 minutes, stirring occasionally. Replace the blackberries in the crumble with a handful of blueberries. Make a sauce or compote without adding fruit juice or extra water as the blueberries will release a lot of juice. Melt the butter and set aside to cool slightly. Crush the digestive biscuits to fine crumbs. Mix with the melted butter. Press into the base of a greased 9½” springform tin. Whisk the double cream until it forms soft peaks. Combine it with the cream cheese, soured cream, icing sugar and the zest and juice of the lemon. Spread over the biscuit base and leave to set for several hours. Place the blueberries in a small saucepan with the caster sugar. Heat gently to dissolve the sugar and then simmer for 2 – 3 minutes. Allow to cool before pouring over the cheesecake. Chill again. Serve with extra pouring cream. Preheat the oven to 160c, gas mark 3. Line a 12-hole muffin tin with paper cases. Sieve together the flour and baking powder. Cream the butter and sugar together until light and fluffy. Gradually add the eggs beating well. Stir in the milk and vanilla extract before folding in the flour. Finally gently stir in the blueberries. As with all muffin mixtures a lumpy mix is what you want rather than a smooth consistency. Divide between the 12 paper cases and bake for about 30 minutes or until golden and well-risen. The fruits expert is house hold name.They should be pace setter for other to follow.